Bring casual comfort into your home with this sectional sofa. Tufting in the seat and back cushions offers a unique look to this piece. 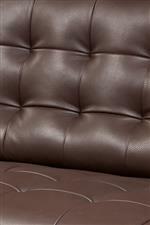 A chaise extends out from the main body, providing a place to relax your legs after a long day. The Parker Casual Sectional with Right Arm Chaise and Tufted Seat by American Leather at Williams & Kay in the Anchorage, Mat-Su Valley, Eagle River, Alaska area. Product availability may vary. Contact us for the most current availability on this product. 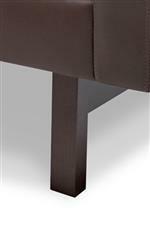 PKR-SCH-RA Right Arm Chaise 1 66" 41" 32"
PKR-SM2-LA Left Arm Sofa Section 1 76" 36" 32"
Leg or Skirt Stainless Steel Legs Standard. Wood Legs Available in Acorn, Espresso, or Walnut Finishes. The Parker sofa collection, with its track arms and square leg bases, will add an element of casual simplicity to your home. 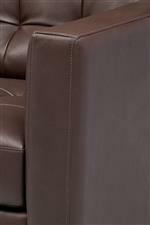 Tufting in the foam seat and back cushions provides a unique look to the piece without sacrificing the comfort that you will ultimately gain. Hundreds of fabric and leather options along with multiple finishes for the base allow for greater customization of the pieces. By bringing this collection home you can easily express your individuality while you are creating your space. The Parker collection is a great option if you are looking for Casual furniture in the Anchorage, Mat-Su Valley, Eagle River, Alaska area. Browse other items in the Parker collection from Williams & Kay in the Anchorage, Mat-Su Valley, Eagle River, Alaska area.